If you’ve ever met me, you know that I love to fly fish. It’s one of my biggest passions. Recently, I was with a friend fly fishing from the beach in Ft. Morgan. I had made this trip many times over the summer without much luck. The weather wasn’t great, but we both had a couple of hours free so we decided to go anyway. Upon arriving at the beach, it didn’t feel like our trip was going to be worth the effort. However, we were already there, so we decided to give our best shot. We both came prepared with a multitude of flies since we weren’t sure what the fish would be biting that day. The first hour of the day was spent walking towards the end of Ft. Morgan and casting in places that looked promising along the way. We managed to reach the point without a single bite. I fished the point for a short while, trying different flies in hopes that something would be enticed. This trip started to feel like the many trips I had made before. With no luck, we decided to make our way back down the beach. As I walked back, I continued casting in places I thought the fish might be holing up. (Many were the same places I had already tried.) About half-way back, I stopped to make a few casts in a spot where the water looked deeper. After a few casts and no bites, I decided to make one more cast and if nothing took the bait, we would head home. As I stripped the fly in, THUMP! I had a bite! Little did I know that I had finally found the perfect spot and in the next two hours, we caught over 60 speckled trout. It was an incredible experience. I had not had a day like that in years! Investing in the market this year has been rough for many. This year’s performance has amounted to about as much as my many trips this summer before I finally caught fish. It has been tough for the investor who faithfully contributes to his portfolio only to see very little impact to the bottom line. Markets like we have experienced this summer seem like the perfect time to pack up and go home. Much like my fly fishing trip, the conditions do not look promising. However, like that trip, there are great opportunities that may be in store. Some of the top-performing days often occur during these times of uncertainty, which reinforces the need to stay fully invested despite the volatility. BlackRock recently published the chart below which shows the negative impact of missing the top-performing days over the last 20 years. 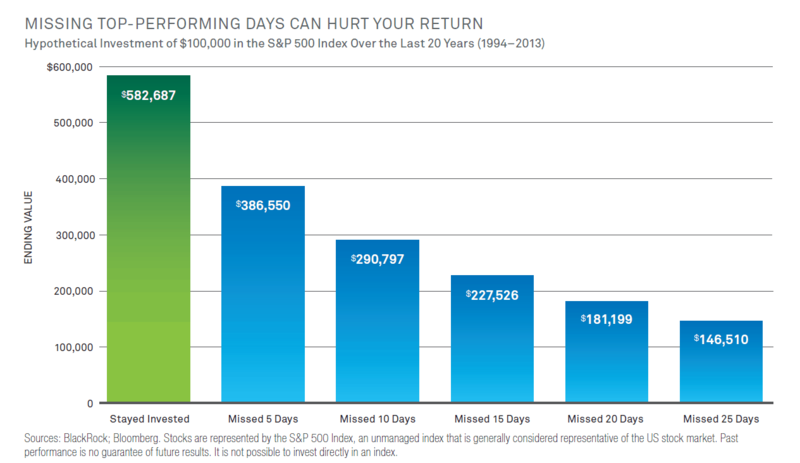 From the chart, you can see that missing just 5 of the top-performing days could have cost you $196,137. When the portfolio misses the best 10 days over the 20 year period, the return is reduced by 50%! Since no one can accurately predict when the market will rise or fall, it is critical to stay invested throughout the volatility. I had no way of knowing which day I would catch fish, but I continued to go fishing knowing that over time the likelihood of me catching fish improves. It is impossible to know which day the market might soar, that’s why it is so important to maintain a long-term perspective. The longer you are in the market, the greater your chances of realizing positive returns. So what do you do in times like these when you’re feeling the pressure to pack up and head home? You continue to work a strategy that has proven successful. On all of my fishing trips, I bring multiple flies because on some days one fly works well and others do not. I cast my line in places that I know are conducive to catching fish, and I am persistent in making the trips—even when the conditions don’t look so great. The same is true for your portfolio. You should continue to invest, even though the conditions look poor; you should keep your portfolio diversified because it is hard to know what is going to perform well next; and you should remain disciplined and dedicated to your goals. It’s like my grandfather always said, “There’s a reason they call it ‘fishing’ and not ‘catching’… you don’t always win.” On any given day, the same is true about investing. But with time and discipline, you are almost sure to find your perfect spot. If you are like many people that are finishing up their last few weeks, months, or year of work; chances are you have a lot on your mind as the first day of retirement approaches. How do you feel? Are you excited? Anxious? Worried? What thoughts are swirling around in your mind? Are you thinking about freedom and relaxation, or are you unsure what you will do with yourself when the day comes and you no longer have to wake up at 5 AM to get ready for work? Regardless of how you feel or what you’re thinking about, you are not alone. We hear stories from retirees each day about what their step into retirement looked like. For some, retirement fits like a glove. It’s as if retirement is a long lost friend with whom they have just reunited. For others, they had big plans for all of the things they were going to do to keep them busy. They were going to golf every day, lounge by the pool, or spend time in the garden. Once they realized they couldn’t or didn’t want to do these activities every day, it was difficult finding new things to fill up their free time. Still, there are others who never thought about retirement until they walked out the door on their last day of work. Many of them managed to figure out how to fill their time, but some couldn’t quite come to terms with being retired and decided to rejoin the workforce. From what we have gathered, each of these three experiences correlates with how much planning the individual had completed prior to retirement. Those that truly thought through what they wanted to achieve during retirement had the least amount of difficulty transitioning. Those that never considered what retirement would be like had the most stress and anxiety as they made their way. So, what can you do to prepare and ensure you have a smooth transition into retirement? There are many things to consider, but here are some ideas to get you started. Ask yourself what you will do with this newly found “free time.” After you come up with some ideas, ask yourself what you will do if and when those things aren’t enough to keep you busy. From what we hear, it happens quite often. Think about the people you normally spend time with during the day. For most of us, it’s our co-workers. Now that you are not seeing them each day, think about who you want to spend your days with. This will also help you determine where you want to live. Some prefer to be closer to town and social events while others prefer being further away. Maybe you want to move closer to children or grandchildren. Map out your goals and future endeavors. As you get closer to that day, it will give you peace of mind knowing that you have a plan in place. No more worrying about what you’ll do. It’s already laid out. Don’t let that first day sneak up on you. Start trying on your retirement shoes today. Each step today will help you feel more comfortable when you finally take that first step into retirement. If you would like to know how we can help you think through these things and uncover your life’s goals, give us a call or click here.